With family members in the healthcare industry, Dr Sanjay knew early on that he wanted to enter the same field. He found dentistry interesting, having the ability to solve problems quickly and get people out of pain on the day. To complete a Bachelor of Dental Science, he studied at University of Delhi. The next stop was Oman, where he sat for examinations with the Ministry of Health and practiced for many years. He moved to Australia in 2006, passing the Australian Dental Council examinations two years later. 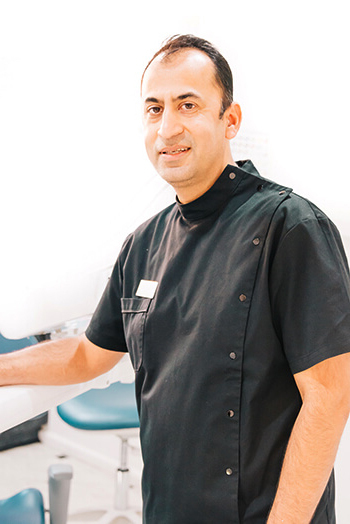 Dr Sanjay treats his patients with compassion and a gentle touch. He takes particular care with children and the elderly. The continuing education courses he’s taken include orthodontics with a residency completed at NAOL, and on Osstem Implants. With a special interest in cosmetic dentistry, he likes to see the changes these procedures can make in a person’s self-confidence. He is a member of the Australian Dental Association and the International Association for Orthodontics. Dr Sanjay has two children, a daughter and son. In his spare time, he likes to be with his family, doing activities such as fishing and playing tennis.